Sleet, snow, rain? Mr. Muffler in Westland wants you to ride into the fall season safely. Mr. Muffler is giving you specials on our service to help you start off the season strong. Having windshield wiper blades that don’t function correctly can cause horrible accidents. This is why we want to send you into the fall season with free wiper blades with your oil change! 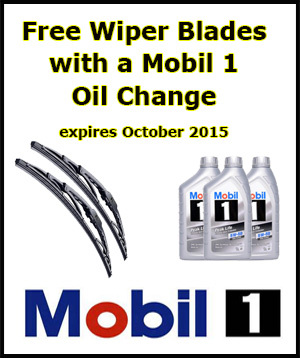 Free wiper blades with the purchase of a Mobil 1 oil change. This offer is good until October 2015! Don’t miss out! Did our oil change special reach you too late? Do you need different type of car repair? Mr. Muffler is your full service car repair company in Westland, MI. Right now, we are offering our blog readers $10.00 off services over $50.00 when you mention this post. *This excludes oil change services. Start the season off right with Mr. Muffler. Contact us today!